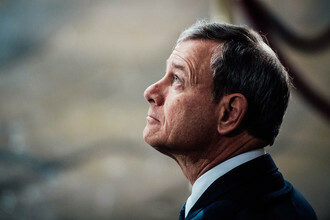 Why Won't John Roberts Accept an Ethics Code for Supreme Court Justices? The first bill introduced this year in the Democratic-controlled House of Representatives had nothing to do with the border wall, the government shutdown, the troops in Syria, or other issues that have dominated recent headlines. Instead, the "For the People Act"—or HR 1—is devoted to government integrity, covering voting rights, campaign finance reform, and ethical standards. Among many potentially controversial and complex provisions, there is one that stands out for its simplicity: requiring the adoption of an ethics code for the U.S. Supreme Court. The fact that SCOTUS justices are the only nine judges in the United States who do not have a written code of ethics is not just a symbolic problem, but a very meaningful one that requires just this sort of legislative solution. The current Code of Conduct for United States Judges, first adopted in 1973 and based on the American Bar Association's Model Code of Judicial Conduct, covers every member of the federal judiciary except Supreme Court justices. Likewise, every state has adopted some version of the ABA code. There's a reason every other judge in the country has a code of ethics by which they must abide: Ethics issues arise constantly at all levels of the judiciary; in the absence of a written code, both judges and the public are left in the dark about how to address and resolve them.